Sheet metal fabrication encompasses a variety of shaping processes to create a final form. For example, some common methods of sheet metal fabrication include bending, rolling, laser cutting, punching, stamping, and water jet cutting. Sheet metal fabrication begins with thin, flat pieces of metal that come in large sheets or coils for easier handling. Some processes can be automated and machines programmed to create multiple, identical pieces to ensure conformity. For many processes, however, the material is worked by a technician using different types of equipment ranging from large metal lathes, to water jets, lasers and even hand tools. Depending on a company’s product and requirements, welding could be a main component of sheet metal fabrication. After the sheet metal parts are formed, they are assembled and tack-welded into place. Various welding techniques can be used in sheet metal fabrication to avoid warping or other visual defects. These include using a stout fixture, welding in a staggered manner, covering the metal with sand during the cooling process, and special straightening processes. Cutting is usually done by shearing. Large pieces of metal are cut into smaller ones to be further shaped by other methods, or may be cut into their final shape. Other sheet metal fabrication cutting methods include lasers, water jets, and torches. Bending is usually done by hammering or with a press brake. Pieces might be bent, rolled, or shaped in other sheet metal fabrication methods as well. Some of the more common materials include aluminum, brass, steel, tin, nickel, copper, and titanium. For special cases gold, silver, or platinum might be used. The best metal for you will depend on your budget and how you plan to use it. 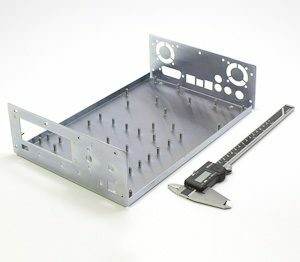 If you’re looking for sheet metal fabrication our experts in our and engineering departments can help you decide on the best material for your particular project. At Excell Solutions, our skilled sheet metal fabrication team has a combined experience of over 100 years. They are backed by experienced engineers and a talented, highly skilled team of various specialists. We’re here to help, so give us a call or send us an email today to discuss your sheet metal fabrication projects. Contact Excell Solutions today to discuss your sheet metal fabrication needs.